Since the last three decades Odissi Exponent Debamitra Sengupta creates such sheer magic with her very own characteristic performances and enthralls the connoisseurs, as well as the masses all along ranging globally – be it her performances at the notable festivals and programmes in her home state, West Bengal, or at the prominent venues of the capital, New Delhi, at Mumbai, down south at Coimbatore, significant performances at the United States in different cities including India Arts & Heritage Society, Seattle, very prestigious performance at the National Theatre, Yangon during the recently concluded performance tour of Myanmar under the ICCR, Ministry of External Affairs, Govt. 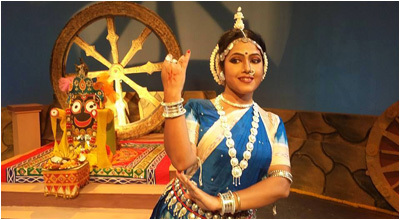 of India as well as a performance tour of Bangladesh under the Ministry of Culture, Govt. of India with the key essence of strengthening relationship between the neighbouring countries through art and culture. The making of ‘Raas Lila’ was the next turning point of her life. 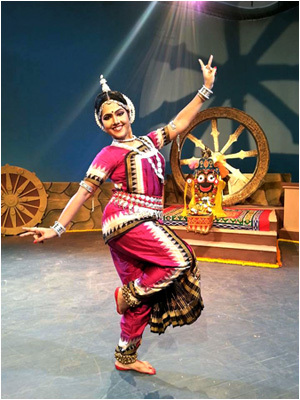 With thorough research she worked on to create a rhythmic fusion on ‘Khol’ and ‘Pakhawaj’ to compose this unique Odissi dance ballet based on the dying art form of Bengal, Padabali Kirtan. Debamitra best known for her grace and fluidity shot to fame with her immaculate choreographic skills. Her passion for Bengali literature – Rabindra Sahitya, Classics like Meghnad Badh Kabya, works of philosopher poet Dilip Kumar Roy and also Sanskrit epics ‘Meghdootam’ by Kalidasa, ‘Draupadi’ from Mahabharata and ‘Padmaavati’ based on Odiya folklore ‘Kanchi Bijay’ led her to conceive several fascinating productions choreographed in the form she understands best – Odissi. During the very special period of celebrations of Rabindranath Tagore’s 150th Birth Anniversary, Debamitra’s compositions on notable works of Tagore in Odissi style have gone places with rich accolades in India and abroad. After her significant tour of Myanmar under the Government of India performing in the Tagore Celebration programmes, Debamitra underwent undergone a commendable and a very prestigious tour of Bangladesh with her much accomplished team members to present ‘Chitrangada’ (in Odissi style) as part of the ongoing Joint Celebrations of the 150th Birth Anniversary of Rabindranath Tagore organized jointly by the Governments of India and Bangladesh. Debamitra, an ‘A Grade’ artist of Doordarshan Prasar Bharati, and an empanelled Classical dancer under the ICCR, Ministry of External Affairs, Government of India, is always in the process of modification and innovation; she strongly believes that our classical dance forms, which have a long cultural memory, would have become museum relics, without inputs of fresh energy to revive them at different points of time. Teaching is also her another forte, besides running her Odissi Institution, Kolkata Mayur Lalit and conducting regular workshops all over India, this tech friendly danseuse teaches across the world through Skype. Debamitra is also into various social activities, she is the Dance Teacher and Counsellor at the Alipore Correctional Home for Women & Children, Kolkata looking after physical and mental well being of the inmates and their children over there. 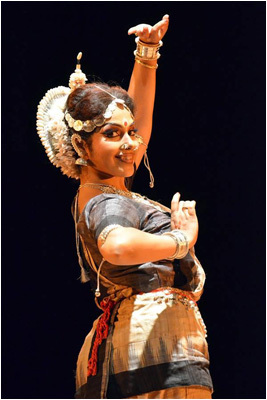 More of a friend than mother to her 21-year old daughter, Nayanika, a promising Odissi talent being groomed under the watchful eyes of her mother, Debamitra treats all her students with the same affability. Best known as the ‘Cool Guru’ among friends and her senior students, she has changed the regular concept of teacher student relationship – no reprimanding, not even mild scolding and the overall amiable ambiance of her classroom made her so popular among her students. The little ones are pampered to the core, instead of wearing stereotype uniforms they are encouraged to wear fancy dresses, to put on lipsticks, kajal, bangles. The classroom looks like a party is going on and the students are so excited about their dance classes and their trendy teacher that they arrive much before their normal class timings and pester with their parents so that they may remain some more time even after the class got over. Thus with her very different approach Debamitra infuses such interest in her students and they are fluently exposed on the intricacies, nuances and techniques of this sublime Indian Classical dance form breaking the common perception or phobia about the classical dance being so rigid of a form or hard to learn.